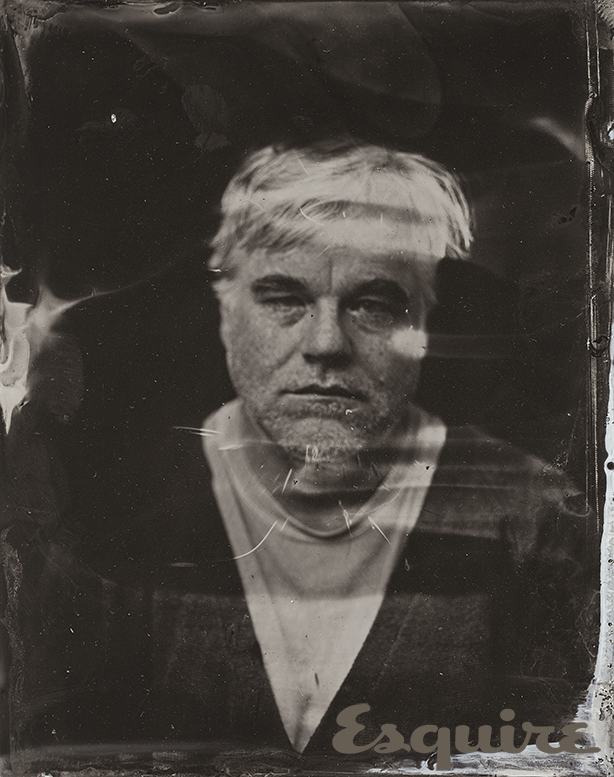 This is one of the last portraits taken of Hoffman ever. Sundance, 2014 for Esquire Magazine. Hoffman wasn’t done, that’s just the sad fact of it all. Not only was he far too young for this day and age to die at only 46 years old, but he wasn’t finished with multiple projects, like his new series Happyish, which is slated to be released this summer in North America, and he also had at least two directorial projects in the works– including one that had recently just had the boon of casting Jake Gyllenhaal for the lead in it, and then of course there’s the heart wrenching fact that he only had seven days left on his schedule for Mockingjay: Part 2, an that seven days was to film only one last pivotal scene. All these projects still in the proverbail air say a lot to me, and that a lot is this– he wasn’t planning on going anywhere. And we didn’t want him going anywhere for a very very long time. Good-bye Mister Hoffman– I wanted to see you play Lear at 80. 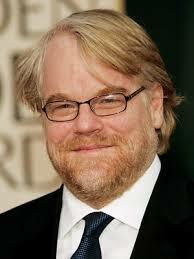 Inevitably you’ve heard that Philip Seymour Hoffman died yesterday. And like all of you, I’m sad. I’m also not feeling very articulate right now. There are many people who can write about his impressive career and talent better than me, so I’ll leave them to it. If you’re looking though, I thought these posts from Salon and The Atlantic were really good. And I don’t feel like analyzing how the Mockingjay movies will be changed right now. My mind started going down that path and I realized how suddenly, the emotional weight that these films would have had just because of the STORY now have an added potency for the most awful of reasons. We can grapple with that later. If you are anxious about the other ways it will affect the movies though, Lionsgate has released a statement on it. Depending on your film-watching habits, you may have been familiar with his work prior to him gracing us with the performance of Plutarch Heavensbee. Or that role may be the your only experience viewing his work. Regardless, you saw in the outpouring of sorrow at the news yesterday that it’s clear that the man was respected by many and this is a tremendous loss. And we Hunger Games fans were lucky to have him as our Plutarch. So what is left to say beyond that this is heartbreakingly sad? I don’t know. Instead, I’ll just leave you with this scene that I really love with him from Almost Famous. 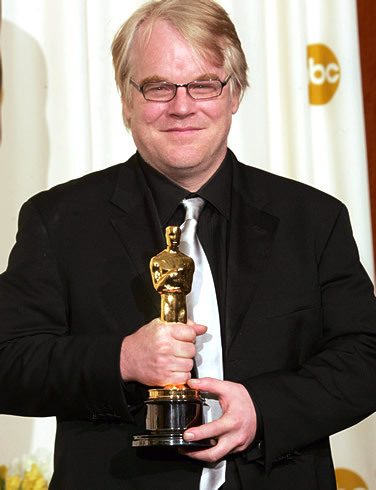 Philip Seymour Hoffman was found dead in his Manhattan apartment this morning, reportedly from a heroin overdose. To say our hearts are broken is an understatement, but this isn’t about us. 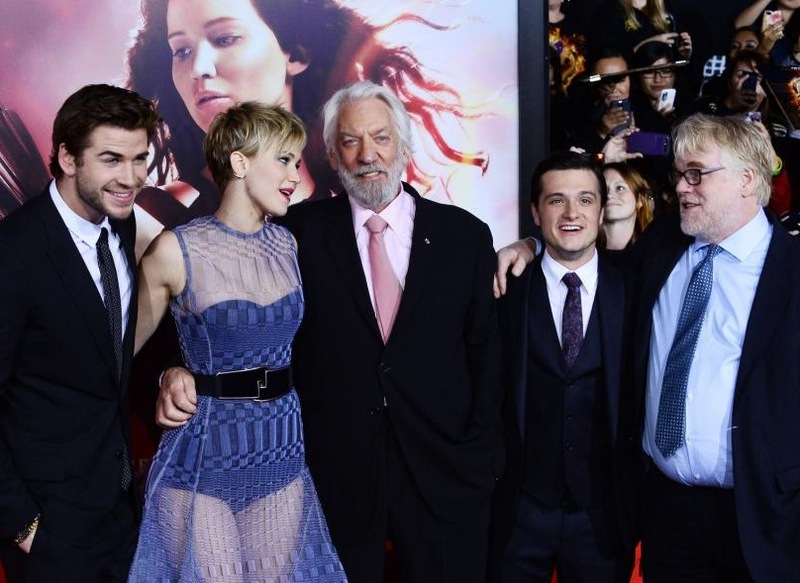 It’s true that Philip was our Plutarch Heavensbee, a part of The Hunger Games family. But The Hunger Games doesn’t have sole ownership over him. Career-wise, this man was a master thespian. If you haven’t acquainted yourself with films like The Big Lebowski, Capote, Doubt, and The Master, do yourself a favor and go watch them. The man knew how to embrace a character and captivate an audience. It’s imperative to remember that he was also much more than what theatrical audiences and fans think. He was also a husband, a father of three young children, and a friend to many others. 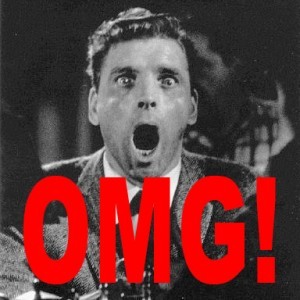 The immediate reaction we’re seeing from a surprising amount of fans is “Oh noes! 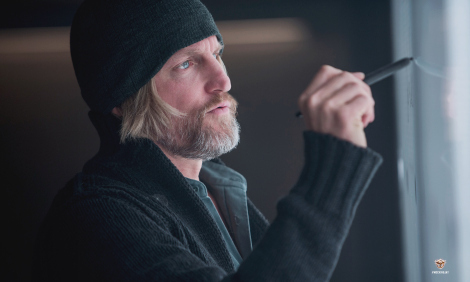 What does this mean for the Mockingjay movies? !” Maybe it’s because the moment is still raw but seriously… How dare you? Yes, there are surely decisions to be made and statements to be released, but they don’t matter. Films can be edited, rescripted, and reshot. Real life cannot. And what’s happened here is very, very real. We’re not going to go on about addiction and who’s to blame for it, nor are we going to talk about angels or the unpredictability of our short, messy lives. We’re especially not analyzing The Hunger Games series or Plutarch. Right now, we’re just doing one of the things that made Philip Seymour Hoffman so good at his job: feeling. Grief. Sympathy. Appreciation. All of it. Don’t worry, you’ll still get your reaction post! It just so happens that we’re all so busy seeing the movie, we can’t find a time for all three of us to get together and TALK about it. It’s a good problem, no? In the meantime, we’re going to give you a conventional SPOILER-FREE review to go alongside the reaction post to come! Let’s start from the very beginning (a very good place to staaaaart)! When Katniss and Peeta win 74th The Hunger Games and return to their new home, broken and distant. They’ve survived, but they’re tentative friendship turned showmance is tepid at best after Peeta learns Katniss’ true motivation. Not to mention that they’re both plagued with PTSD. It all leads up to The Victory Tour, which is where Francis Lawrence really gets to sink his teeth in and show us what this movie is made of. We don’t see much of the individual districts, but we’re offered a few shots that serve as shining examples of the bigger budget and Francis’ eye for detail. This movie is mostly character driven, which we found super refreshing. Without adding significant film time (THG and CF are actually the same length), we see Peeta, Gale, Haymitch, Effie, and Show’s roles expanded. 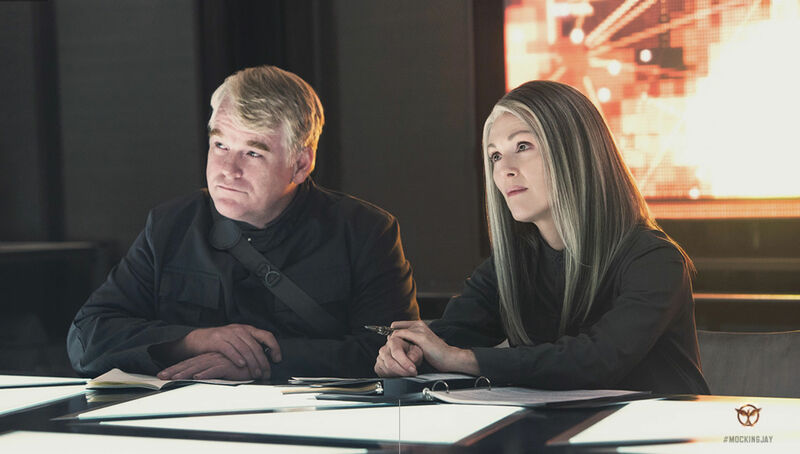 It’s not just extra lines– the characters seem richer, with deeper personalities and more individual significance outside their relationship with Katniss and Peeta. Some people weren’t thrilled that other scenes were fast-moving, but we think it was worth it to get some character development in there. It’s at the end of the Victory Tour that we meet Plutarch Heavensbee, portrayed with gusto by Philip Seymour Hoffman. You can’t help but marvel at his unprecedented political savvy and manipulations. He doesn’t lose his cool for a single moment and meanwhile, we were totally freaking out. 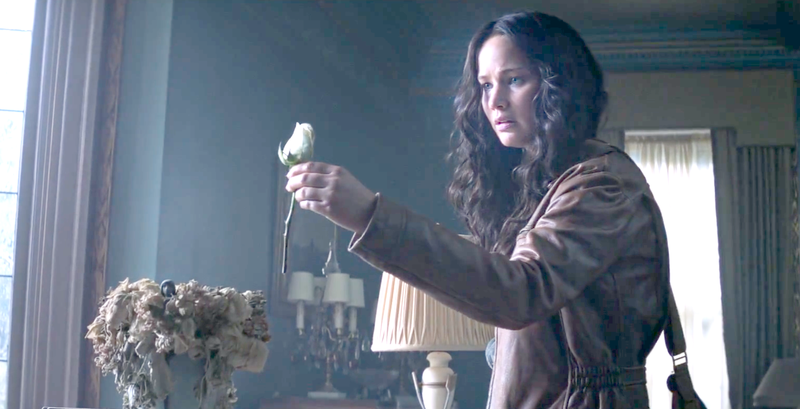 Chemistry-wise, the relationship between Katniss and Peeta seems more organic and palpable this time around. It goes without say that Jen and Josh are both extremely talented actors and dear friends in real life, which translates beautifully. 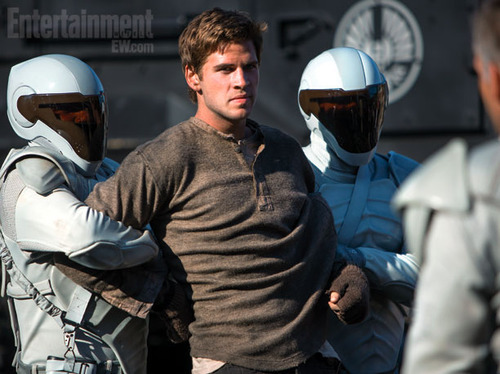 That being said, Catching Fire is significantly more Gale-centric. Jen and Liam have presented a strong case for Kale/Gatniss/whatever else we want to call them. Their relationship plays off as a look at two friends falling for each other, brought together by the stress of impending rebellion, but still plants hints of what’s to come in the Mockingjay films. 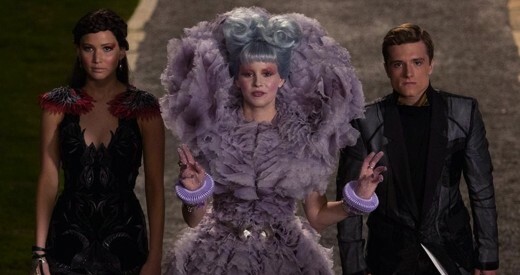 When the Third Quarter Quell is announced, we finally get some new victors! And what a group they are! Sam Claflin is our Finnick. He embodies the character’s dramatic preening and sensitive soul with a stunning fluidity that we doubt we could have gotten out of many of the laughable fan suggestions that came out during casting. And it doesn’t hurt that he is really, really, ridiculously good-looking. 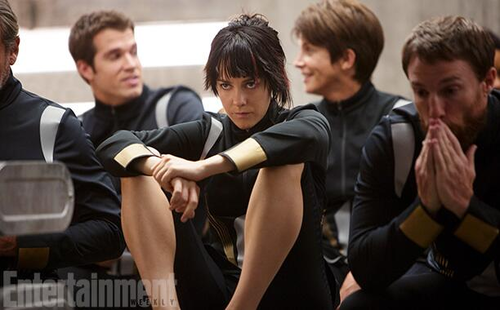 Jena Malone is able to capture Johanna’s anger with such ease and honesty that you know it’s her true spirit, not just an act. Jeffrey Wright gives a master class in acting as he transforms so perfectly into unusual techie extraordinaire Beetee, but Amanda Plummer gets the scene-stealer award for her zany portrayal of Wiress. 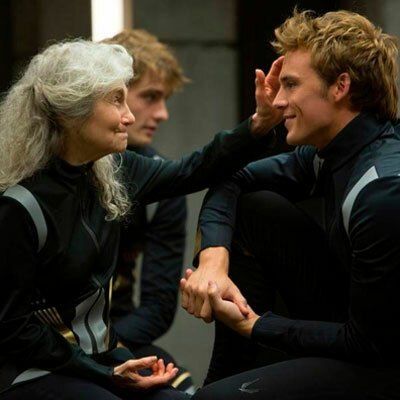 And Mags? Forgetaboutit! We all want to adopt Lynn Cohen as our new grandma! With a more appropriate level of violence this time around, the Career pack actually felt menacing. Bruno Gunn’s guns and his expert snarl were intimidating. Meta Golding has the Enobaria growl down to a science. And despite being living barbies, Cashmere and Gloss were surprisingly badass. However, this group did feel a bit under-utilized given that they were meant to pose an immediate threat to Katniss’ life. The ending is heart-breaking and devastating and everything we ever wanted it to be after reading the books! We’re not saying the movie was perfect down to the very last detail. There’s a lot to consider and we’re sure everyone will find a little something to gripe about (Don’t we always? ), but this movie is an extremely faithful adaptation and for us, the clear winner of the franchise so far. 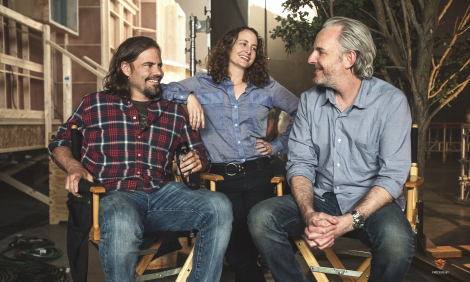 Though we loved Gary Ross’ work, Francis Lawrence provided us with a smart, pulse-pounding, emotional journey that had us thanking him by the end. How Many Days Until Mockingjay Part 1?! Admit it, a half a day ago we were all kind of disillusioned because of the appearance of a certain photo that we perhaps had seen before, but were yeah–anyway. I’m going to pretend none of the negativity of the earlier part of the day ever happened, and that that certain picture is just something that happened months ago. Which brings us to only a matter of a couple of hours ago when this lovely photo finally became clear to our eyes, and we wept with joy, because– well, I don’t know why, but I’m sure some sleep deprived fool out there cried. If you cried, I assure you there’s no shame in that. So, what are we looking at here? 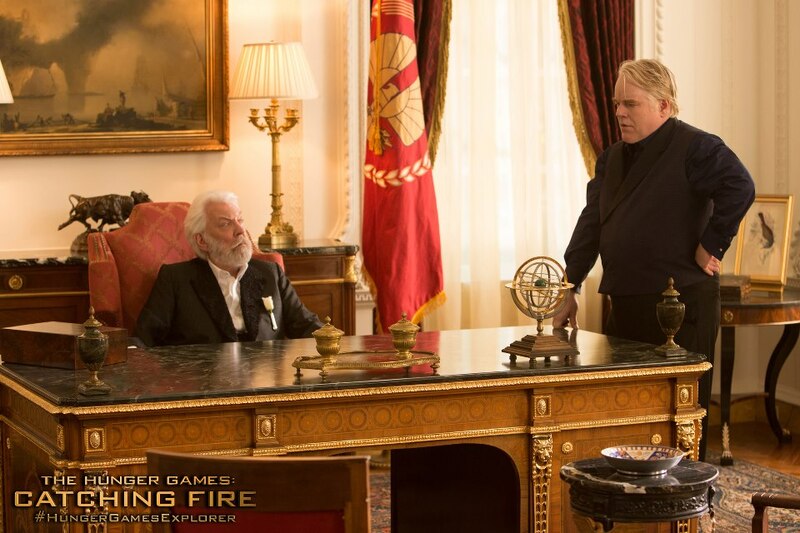 Well, obviously it’s a photo of President Snow and Plutarch Heavensbee having a little chat. However, what else is in the photo other than those two fine gentleman, okay only one of them is a gentleman, the other is just a Tyrant who dresses really well. All right, if you’re a regular listener of The HG Fireside Chat hosted by our dear friends Savanna and Adam, then you know that I’ve been on the show, and I’m the one who went into insane detail about the chairs that most of the characters in the Capitol Portraits sat in. See, I studied interior design, and had to take several courses on the history of furniture. I know, sounds boring, but it’s not– basically I was studying many of the things that people on the very popular PBS series Antiques Roadshow have the ability to point out and prove about certain pieces brought to their attention. Not very funny stuff, but it’s interesting to me, and frankly– I love it, I want to get an MA in this stuff. But what’s in the picture!? Well, I can tell you that, and not just say “a desk”, “a chair”, “a table.”, “an oil painting”, Because, dear readers, those aren’t just simple pieces of furniture, and that’s not just an oil painting. The Desk: It’s an 18th century Chippendale pedestal desk. How I know it’s Chippendale, the marquetry (marquetry is all the gold stuff), the wood that’s been used (mahogany), and the fact that an extremely similar version of it is staring back at me from one of my many reference books. Yep, I have a little library of antique furniture, and decor books. The Sideboard: It’s probably not Chippendale, but it’s roughly from around the same time– maybe twenty years on, but on the cusp of the same style era. It’s Regency, it’s likely English, and yes it’s also mahogany. I’d be able to tell you more if I could see all of it. The Chair: We’ve actually seen this chair before if you recall? It’s the same chair Cinna sat in in his Capitol Portrait. And what it is is a William and Mary wing chair. Why it’s called a wing chair? ‘Cause it’s got tiny wings on the shoulders. Genius, I know. What it’s made of? Probably walnut, not everything can be made of mahogany, sadly. 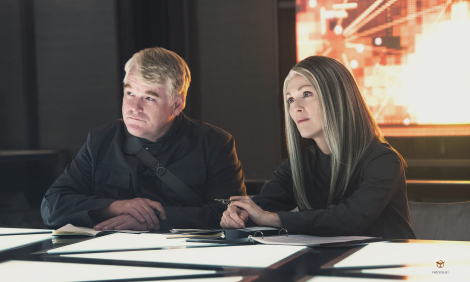 The Drum Table: That would be the table behind Plutarch, and it’s called a drum table, because it’s shaped like a drum. This one’s likely Regency style as well, but I think it’s American, which makes it American Federal. These are styles and eras that overlap, and basically only have an ocean between them, literally. Oh, and it’s also likely made of mahogany. The Occasional Table: The little guy in the foreground with either the marble top, or the tortoise-shell top. It looks Regency, but it could be a revival piece from the early part of the 20th century, making it perhaps Edwardian. Again, if I could see all of it, i.e. its feet and legs, I’d have more information for you all. Now for the decor! The oil painting on the wall is screaming symbolism to me! Why? because I wholly believe it’s an oil painting circa 1776-1800 that’s depicting a maritime American Revolutionary War scene. Just think on that for a second. And then we have the framed print on the drum table, it looks strikingly like an Audubon-esque picture of a Mockingbird. Audubon if you don’t know was a world-famous artist best known for his accurate, artful, and impeccable paintings of birds. 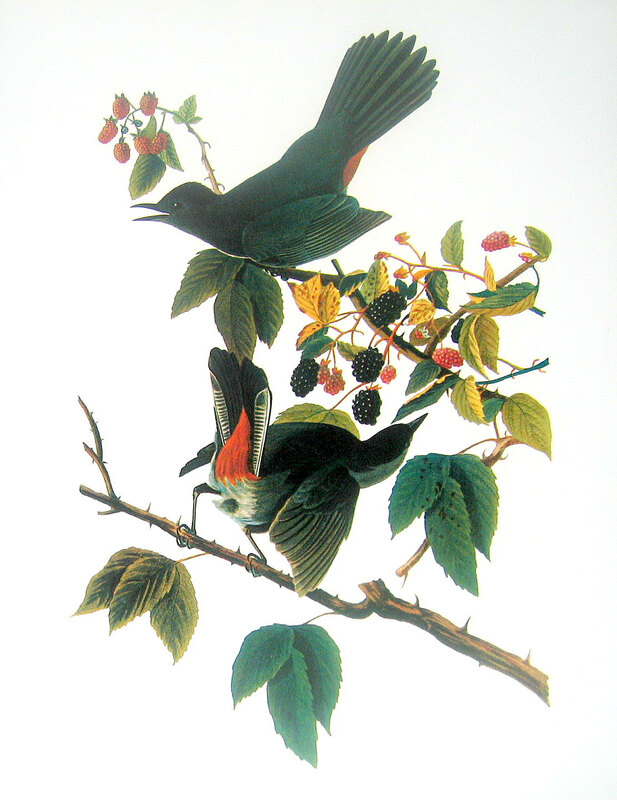 Ever heard of the Audubon Society? Yep, same guy. Anyway, it’s telling that they have a print that while I can’t tell if it is one of his, but it looks a lot like his style, of a Mockingbird in his collection. President Snow has a print of the fated mates of his Jaberjays, the mother of his Mockingjays in his tastefully appointed office, that cannot be an accident of simply style, and taste. Everything in that office means something, or at least it does to me. The fact that majority of the furniture is Regency style says to me “this man is temporary,” because that’s what a Regent is, someone who sits on the throne until the rightful heir comes of age. The oil painting of probably an American Revolutionary War scene says to me “a revolution is literally staring at the back of your head every bloody day, you fool.” His chair is a William and Mary wing chair, says to me “he is a conqueror, who likes people to think he’s kind, and noble.” And the bird print, that’s a symbol of his triumphs and his failures, because while the Mockingbird is as innocent as they come, unbeknownst to him he was the creator of the symbol of a revolution by letting that ancient bird mate with his abominable creation. 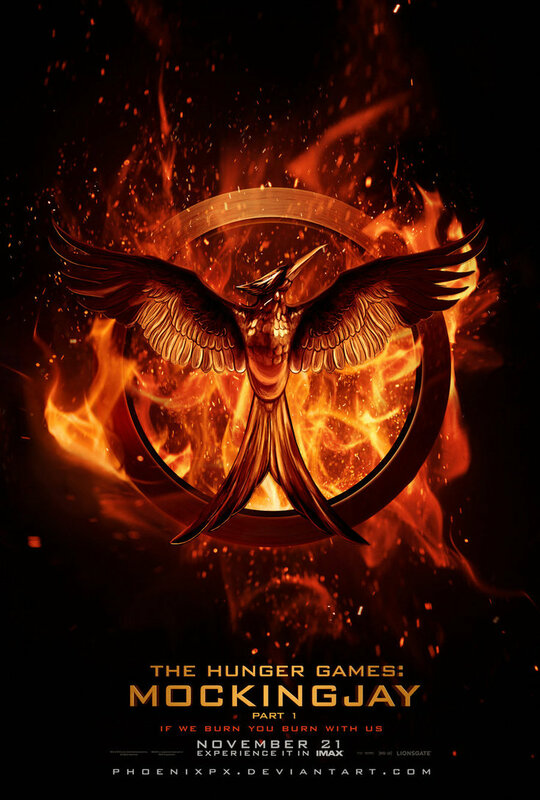 Just like with the first movie, our friends at HG Fireside Chat posted a list of 100 Things to Do Before Catching Fire. Of course, I had to go through the list and pick out my favorites and some of the ones I’ve actually done! 3. Visit your local bakery and ask if Peeta’s working that day. 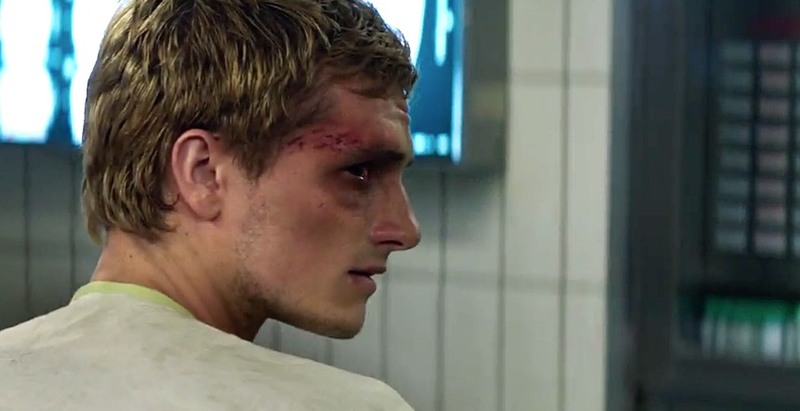 There’s a blond teenage boy that works at a bakery near my work, and in my head I call him Peeta. Maybe I’ll actually do this… and confuse the heck out of everyone that works there. 22. Sing Alexander Ludwig’s “Liv It Up” at karaoke. Oh yes, I already do this. In my own personal karaoke room called my car. 35. Blame the Capitol when something doesn’t work properly. 36. Then credit Beetee when it’s fixed. I have a lot of electronics, and they quite often give me trouble so this one is a snap. And of course I’ll credit Beetee the day my Blu-ray player decides it wants to connect to my wifi. 42. Put a “Victor’s Village” sign on your door. WHY HAVEN’T I DONE THIS ALREADY? 68. Get your picture taken next to the first Catching Fire poster you see at your local movie theater. You bet I’m doing this. And I’m still holding out hope for my huge Sunset Blvd advertisements. 76. Search everywhere for a purple robe with a fur-trimmed collar for when you become Head Gamemaker. No luck still, but I’m keeping an eye out! 80. Watch a Phillip Seymour Hoffman film in which he has a full head of hair. I have quite a few of his older movies on DVD, but I’ve always got a special place in my heart for Dusty. 90. 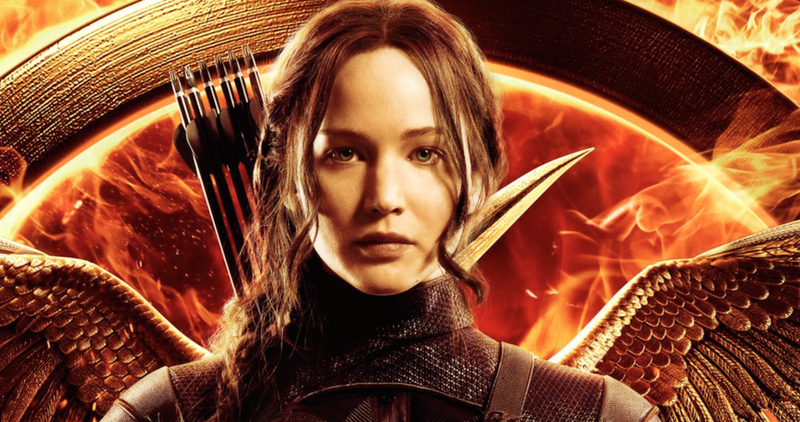 Buy a friend a Hunger Games-themed creation on Etsy. Check out the full list at HGFiresideChat.com in video and non-video form!